The national tour of Jekyll & Hyde opened at the Kravis Center on March 25, 2013. 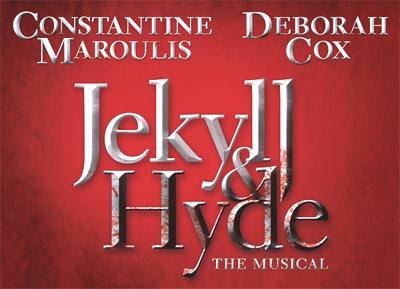 After four years on Broadway and multiple world-wide tours, this dark and dangerous love story from Tony® and Grammy® Award nominee Frank Wildhorn returns in a stunning new pre-Broadway production that first grabbed audiences and transformed JEKYLL & HYDE into a theatrical phenomenon. Jeff Calhoun directed a cast that featured Constantine Maroulis and Deborah Cox. Let’s get it out of the way: Shaggy Constantine Maroulis is far better than you expect in the title role of this Broadway-bound revival of Jekyll & Hyde ending its national tour at the Kravis Center – although that might not be saying much. And second in the must-get-it-said department: R&B recording star Deborah Cox as the doomed prostitute Lucy steals the entire show right off the stage of the Kravis Center with a gorgeous voice perfectly suited to Frank Wildhorn’s pop opera score. But by the time the show has reached its penultimate two-faces-of-Eve showdown “Confrontation,” the whole thing has devolved into a screaming, unintelligible mess in which everything is way too much, from the wall of noise passing for words and music, to the pyrotechnic projections designed for a future arena tour, to whatever passes for acting. Within Bricusse’s script and Wildhorn’s vision, J&H does harbor an innately exciting story, it does raise intriguing moral questions, and when done right, it should touch your heart with the tragic tale of a good man who lost his soul trying to better humanity’s lot. But this edition is simply trying to overwhelm you with vocal and visual spectacle. 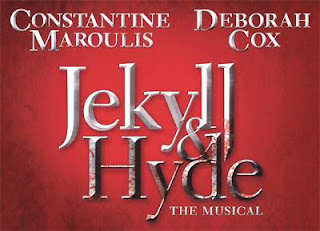 The 1990s creation, with music by Frank Wildhorn and lyrics and book by Leslie Bricusse, has been revamped to showcase the talents of rocker Constantine Maroulis in the title role and R&B singer Deborah Cox as Lucy, the prostitute who falls for Jekyll. As a result the show bowls along from one over-sized number to the other. Admittedly, the strategy provides some megawatt moments, but ultimately the production sinks into sameness and bombast. Maroulis fills the twin shoes of the hero and anti-hero with conviction. His transformation from the idealistic Jekyll to the malevolent Hyde is compelling, and he nimbly navigates the distance from introspective tunes such as Lost in the Darkness to full-out songs such as the raw-voiced Alive. Cox makes a fetching Lucy, with her big, expressive voice invariably at ease, whether in come-hither mode, as in Bring On the Men, or wistfully lovelorn, as in Someone Like You. Teal Wicks, playing Emma, Jekyll’s unfortunate fiance, has a golden, seamless voice, but spoils her appeal when she affects a too plummy British accent in her spoken lines. When Jekyll loses his moorings and degenerates into chaos, the show does, too. It’s doubtful the audience needs flashing lights, booming music, fiery projections and distorted voices to appreciate the tragedy of Jekyll’s collapse. A lighter, brainier touch would have served Robert Louis Stevenson’s classic tale much better. The national tour of Jekyll & Hyde plays at the Kravis Center through March 31, 2013.